The Dragster 800 RR Pirelli is born from the collaboration between Pirelli and MV Agusta, Italian companies that stand out for their industrial history and are united by values ? ?such as Made in Italy design and the vocation to sportiness. BREATHTAKING ACCELERATION: In this configuration, the three-cylinder engine powering the Dragster 800 RR develops 140 Hp at 13.100 rpm and a maximum torque of 87 Nm at 10.100 rpm, with a fluid delivery at lower revs and an extraordinary acceleration, tamed only by the rev limiter intervening at 13.200 rpm. NEXT GENERATION ELECTRONICS: The MVICS with full Ride By Wire has been further improved. 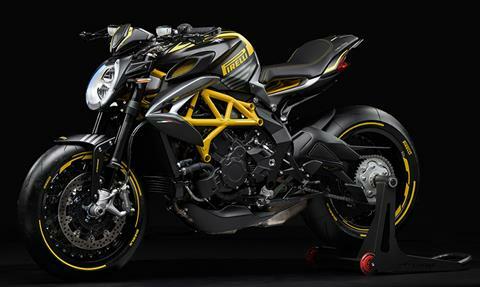 The unprecedented mappings were specifically developed for the new Dragster 800 RR. Traction control is adjustable on 8 levels and the sophisticated electronic up & down gearbox is mated to the hydraulic slipper clutch. An immobiliser with key recognition rounds up the offer. ENGINE: The three-cylinder engine was improved to comply with Euro 4 regulation and also to enhance performance and reliability. The engine’s anchoring point to the frame has been revised, as well as the primary gears, valve guides and the cam phasing. The gearbox is also new, quicker and requires less force on the lever to engage gears. THE SAFEST RIDE: When there’s nothing else to worry about than riding pleasure, fun is at its top, especially when your safety is guaranteed by a Bosch 9 PLUS two channels ABS system with Rear Wheel Lift-up Mitigation. The RLM system shoots in to mitigate excessive braking action on the front wheel and avoid rear-wheel lift. 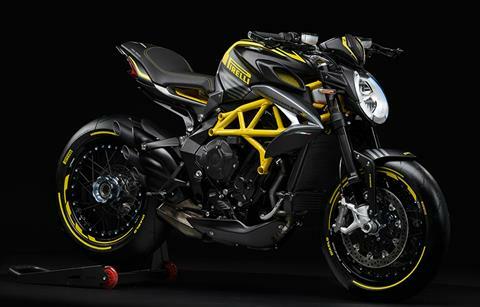 DETAILS: A gritty design with a black and yellow base; with the distinctive Pirelli logo to achieve a unique result, which makes this Pirelli Dragster 800 RR truly unmistakable. LIKE NO OTHER: The weight distribution, the refined chassis and suspension as well as the Dragster’s unique character are the main characteristics of a machine that was created for the most demanding riding enthusiasts. EMOTIONS WITHOUT COMPROMISE: Super compact, aggressive, stunningly good looking. The design of the Dragster 800 RR takes no prisoners. Emotion in its purest form. Front - Aluminium alloy spokes 3.50 x 17 in. Rear - Aluminium alloy spokes 6.00 x 17 in. Front - Marzocchi “UPSIDE DOWN” aluminium telescopic hydraulic fork with DLC treatment, with anodized fork legs and having rebound-compression damping and spring preload external and separate adjustment; Fork Diameter - 1.69 in. (43 mm); Fork Travel - 4.92 in. (125 mm). Rear - Progressive Sachs, single shock absorber with rebound and compression damping and spring preload adjustment; Aluminium alloy single sided swing arm; Wheel Travel - 4.92 in. (125 mm).